After sharing the ACC Indoor Track and Field Championship on the men’s side and narrowly missing doing likewise on the women’s side, Florida State took home four of the eight individual honors given by the conference on Tuesday. Junior Kasaun James and sophomore Ka’Tia Seymour were each named ACC Track Performer of the Year. Both were named Track MVP during the ACC Championships last month in Blacksburg. At the NCAA Championships earlier this month, James earned the silver medal in the men’s 200 meters while earning first-team All-American honors in the 60 meters. 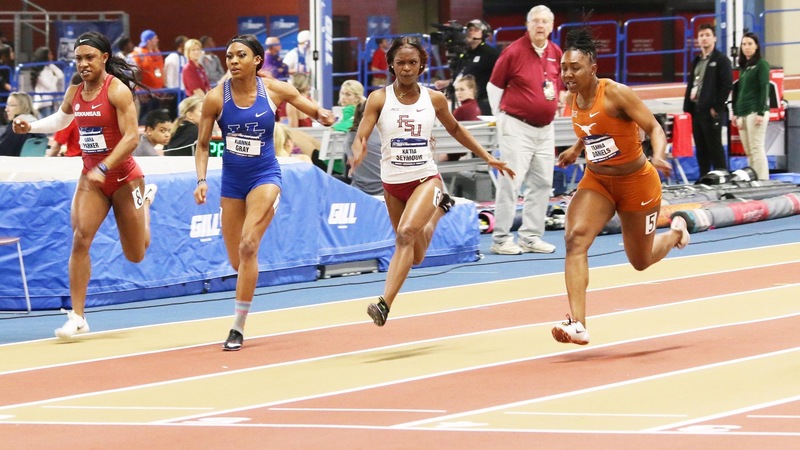 Seymour earned bronze in the women’s 60 meters at the NCAA Championships — the highest finish for an FSU female sprinter in the event since 2000. Bryand Rincher, a sprinter, was named ACC Men’s Freshman of the Year for the Seminoles. After winning silver for the 200 meters in the ACC Championships, Rincher earned first-team All-American honors in the 60 meters at the NCAA Championships in Birmingham. Bob Braman was named ACC Men’s Coach of the Year after sharing the ACC indoor title. The Seminoles finished sixth at the NCAA Championships. FSU began the outdoor season on Saturday at Florida A&M. Next, the Seminoles will host the FSU Relays, which begins on Friday.